I was very happy with my results today for the 3M half marathon. I pushed it from the get-go so my heart rate was high throughout, but was able to maintain it over the entire race. I don’t know why. It’s a mystery. Although it’s not a PR, it’s the best I’ve done this season of such up and downs. I finished in 1:52:54 (8:37/M pace). If I plug this into the McMillan running calculator, it says I could do a marathon in 3:58:06 (9:06/M pace). Sweet! Anytime I think I can break through the 4 hour barrier it is special day. Even better I got another medal for my “ego” or “show-off” wall in the study. These are my half marathon medals. The right cluster is Motive. The left cluster is 3M. The new one is on the bottom and second from the left.Afterwards I changed in the porta-pottie into warm dry street clothes, briefly went to the Rogue breakfast, and ate with Kelly and Bob, but left immediately afterwards and caught the bus back to the starting line and my car. Note: My heart rate monitor recorder again did not work and capture the data. So there is no graph. Ugh. So here is my analysis for setting my goal for the marathon. 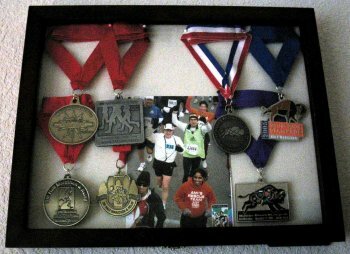 Here are a sampling of my past races and other times. As a result I think I should state my goal as 4:15 with a 9:44/M pace. Naturally my dream would be to break 4 hours, but that’s quite unlikely based upon my past performance shown above, nor is it appropriate to push this hard at the start knowing that this will cause me to crash and burn (bonk) later. In any case this is quite a difference from the 3:45 goal I had last year, but then I’ve not been pushing it as hard this year. However, a 4:15 is a best-can-do goal depending upon conditions that day. OK, there I’ve said it. Now only time will tell what the truth is. We had class tonight. We warmed up with a 1.5 mile run on the road near the school. Luckily we didn’t have any drills. Then on the track we ran 1000m at 10K followed by 400m slow jog recovery, and did that five times. My 1000m at 10K were 4:58.67, 4:55.99, 4:47.25, 4:43.66, and 4:47.16. When done I cooled down from 1 mile. At the end I was exhausted, but was happy with my results. Well today was the longest run so far – 22 miles. I woke at 4:20 AM, and decided to get up instead of waiting for the alarm at 5 AM. I dressed, ate breakfast, and drove to the end (RunTex Riverside). Rushing around there I accidentally dropped my car key and had a hard time finding it in the dark. Luckily a young lady helped me and found it. At 5:30 AM I caught a ride with Larry and Dan to the start (RunTex Gateway). At 6 AM we started. It was drizzling and cold (39 degrees Fahrenheit). I wore tights, three upper layers, ear band and hat. For the most part I was warm running. In the end I ran it all, that is, no walking. However, it was ugly, and I ran anyway I could – you could say at the end that I shuffled. Regardless I just put one foot in front of the other, and I completed it in 3:58. Not very fast, but hey I ran it all and that made me feel good. Most years I don’t do as well. By the time I was done I was soaked through. My clothes probably weighed over a pound with the water weight. This time I tried to bring electrolytes. Having not bought any earlier in the week I tried REI the night before but they don’t carry any. So I brought about a teaspoon of salt in a baggie and one small bottle of Electromix. I was planning on only using the Electromix, but after the first use I forgot to close the squeeze cap and by the next stop it was empty. This wasn’t good. So I switched to Gatorade loaded with salt from my baggie. It tasted awful and it upset my stomach a bit. However at the end my legs weren’t cramping so I’ve got to continue to do something like that. I was to run MGP from 6-10 and 14-18, but only really tried from 6-10. The rest I just slogged along by myself in the drizzle and cold at whatever pace I could make myself do just to move along. 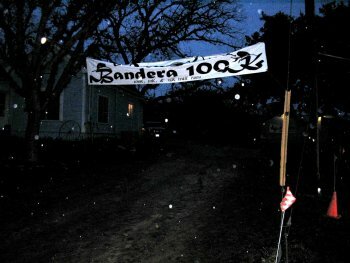 Well I just returned from Bandera, TX and volunteering at the Bandera 25K/50K/100K. I’m quite tired yet quite satisfied On last Friday I took 1/2 day off and left home about 2:30 PM. About 137 miles of driving and a few hours later I arrived at the Hill Country State Natural Area. I found the CrossRoads aid station area where I’d be working, but no one was here. So I drove about 1.5 mile further to the registration area. There I learned that dinner would be in about 1 hour. So back to the aid station and set up my borrowed tent before it got dark. I did an OK job setting it up, not great, just OK. Then it was back to registration for a spaghetti dinner where I met a few people including Dan, the head of the CrossRoads aid station. After dinner at 6:45 PM I returned to the aid station area, but now it was dark. So I climbed into my tent, got ready for bed and read a book until I was tired. Over the night it began to rain. It drizzled on and off all night. However at about 3:45 AM I woke with water dripping into the tent. Ugh. I can’t handle a wet bed. So I took all my things out of the tent, packed them up, put them into the car, went to the porta-pottie, and went to sleep in the car. At 6:30 AM Dan work me up by tapping on the car window. The rain had mostly stopped, but everything was damp, yes everything. The temperature was between 60 to 75 degrees Fahrenheit. 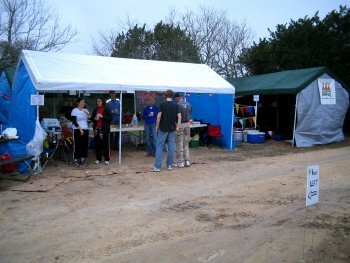 So after getting up I met many of the other volunteers and I helped prepare the aid station. The race started at 7:30 AM several miles away The lefthand tent was actually two aid stations. The back was CrossRoads-In and the front was CrossRoads-Out. Between the two is about a 5 mile inner loop. 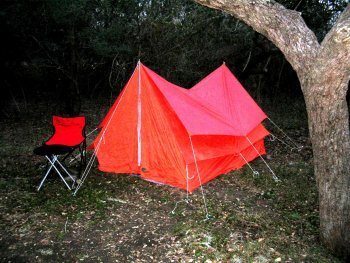 The righthand tent was for runner’s drop bags. At about 9 AM the first 25K runners arrived. I helped fill the bottles with water, Gatorade or Heed and provided cups of this and sodas. Throughout the day various 25K, 50K, and 100K runners arrived and I did whatever Dan told me to do. A few brief showers occurred during the day. The mud and muck was always present. Our shoes were caked with it. Everything was damp or wet. Then about 5 PM the weather suddenly changed. The temperature dropped 30 degrees down to 40 degrees. We could see our breath. Suddenly the runner’s requests changed from water to cool down to hot food to warm up. They started using their drop bags to add clothes, and change socks. This continued throughout the night. Different runners would arrive in various levels of pain, exhaustion, and awareness. Some stopped for moments, others stayed many minutes, most continued on and a few DNF’ed right there. We cheered them all into the station. We helped where we could. Finally at about 1:30 AM the last 100K runner came through and we were done. Note: that runner still had 10 miles to reach 100K (about 62 miles). During the day I had fixed up my tent and this time hopefully it would not leak, but early in the morning I was woken by dripping noises. At about that time Dan told me that it was time to wake up. It was still wet and quite cold. For the next few hours I helped pack up – this time with a much smaller team of six. By the time I was finally released by Dan I was soaking wet and muddy. So I changed all my clothes and headed home. It was fun. The sense of community at the aid station was great because we had to work together for the whole weekend. And Dan was great to work for. I’d do it again. I went to bed at 10:45, but probably got to sleep at midnight. Just couldn’t turn my brain off. Got up at 5 AM. Got shaved, dressed and ate breakfast. Did all my normal things in preparation for a race day especially a long one. Left the house at 5:30 AM and drove to San Marcos, TX. It’s about a 50 minute drive. Arrived at 6:20 AM and parked. I went to the porta-potti. Then I rested in the car with the heater on. The outside temperature was about 45 degrees Fahrenheit. I changed my clothes a bit to adjust to the location, and temperature – took things off. Still had on two long sleeve shirts, shorts, gloves (two layers), and a hat along with ear covering. I found the 4:15 pace group lead by Dan-O and Kate just a few minutes before the start. This pace is 9:44/M. The race was through a series of country roads and rolling hills. 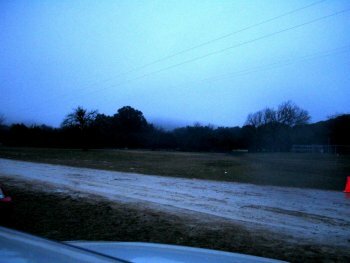 Nothing much to look at – pastures, a few homes, and a large power plant – nothing exciting and after a while I’m so focused on ending the pain of the race I see nothing around me. Once the race started the crush of people (over 1000 of us) caused me to be about 50 feet behind my pace group. I sped up to catch them. At about mile 3 I was ahead of the pace group and I had to pee behind a telephone shed. I had felt the need for a while, but it was too late at the start to go. Now the pace group was ahead of me. Slowly over the next few miles I caught and passed them. I took a Clif-Shot every 5 miles and drank at every water stop. Around mile 13-15 I was getting tighter and stiffer. The last few miles were very tough. Especially when the last two miles ran into a headwind. Around then the two pacers passed me, but none of the original crowd was with them. The pacers were running alone (no Tony, or no Melodye, etc.). Nevertheless, I ran the whole thing (except for water stops) and finished in 3:15:10 or 9:49/M pace with a position of 512 out of 1120 and 16 out of 29 in my 55-59 age group. I was also disappointed that they didn’t hand out medals instead they gave out a coffee mug which I refused. Afterwards my legs were cramping badly and I could barely walk. I was so sore and stiff. So instead of staying and talking to friends I hopped in my car and drove home. During the drive I was yelling each time my legs cramped and throbbed. Thanks for speed control. By the time I was home at least the throbbing had subsided. On the way I rubbed my face and could feel and taste granules of salt. I might need to consider taking salts during my runs. This run was very tough for me. Oh, but I did PR (after the debacle of last year’s 20 miler where I ran faster, but hit the wall and walked the last 4 miles). I just signed up for the following races: the ARA 20 Miler on 1/7/2007, the 3M Half Marathon on 1/28/2007, and the AT&T Austin Marathon on 2/18/2007. Wish me luck.